On March 1st., 1942, I was picked up by a Japanese Whale Boat and taken to a Japanese repair ship. There were five or so other American prisoners on board. I was taken to their "sick bay", had some shrapnel removed and joined the other prisoners. We were questioned by their captain. We were fed and treated well. We knew nothing. Time elapsed (don't know how much but somewhere around a couple of hours) and the ship was torpedoed. I put my trousers on (inside out) and went over the side. At this point I was again picked up and joined Dr. Stening on the Jap destroyer. I did not met or talk to him.Topsides of the Jap destroyer was covered with prisoners - English, Australian and as far as I know one American (me). My experiences were similar to the first page of the reference letter. My English friends took me to see Dr. Stening. Dr. Stening had offices (outside) and in back of the cinema not far from an open latrine. Dr. Stening removed more shrapnel using a razor blade as a scapel. Again I remember requesting something to smoke during surgery. Dr. Stening told them to give to me only after he was finished with the work at hand. I spent the remainder of the war in bicycle camp in Batavia (now Djkarta). I was born on November 21, 1919 at Collegeville (St. John’s University), Minnesota. The actual location was a collection of houses variously known as “Flynntown” & “Flynnville”. My father was the “Director of Athletics” at the University. As were my brothers, I was named after a priest at the school, The Rev. 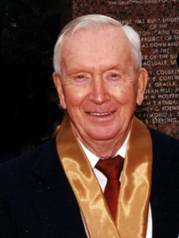 David Yeunger, O.S.B. The 1920’s were the happiest days of my pre-teen years. The economy was good, my dad had a prestigious job and income and this opened opportunities. Initially, I attended the legendary one-room school. Oversized desks accommodated two students, the first through the 8th grades were taught and German, including German Primers, was the beginning language. Parents in the community spoke German exclusively and relied on the school to teach their children English. I never learned German. The opportunity for fame occurred early - when I was about five or six years of age. I was selected to star (due to my unique acting skills and the fact that I was the Athletic Coach’s kid didn’t hurt) in the Dramatics Department’s production of The Silver King, an adaptation of William Tell. I was William Tell’s son, David. The big scene was the shooting of the apple off David’s head. At a prearranged signal, the archer was to fire the arrow and David was to shake his head allowing the apple to fall. In the confusion, the archer didn’t shoot the arrow and David shook off the apple. This was undoubtedly the high point of the play; paroxysm took over the audience and my acting career ended. The Right Reverend Alcuin Deutch became Abbot and President at St. Johns University. He believed that athletics had no part in a college curriculum. Athletics was, he believed, barbaric and brutal. 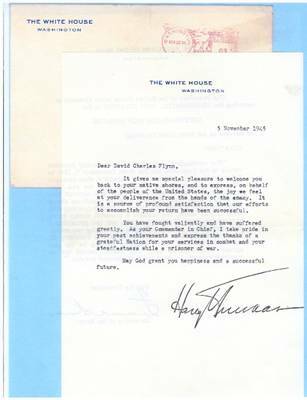 In early 1930, he summoned my dad and simply stated, “Flynn you’re through.” I suspect that the Great Depression also influenced the decision. The family moved to St. Paul, Minnesota. This was the beginning of the “Great Depression”. Times were really tough. My dad went into the “ditching business” with his brother, Dan. This eventually went bust and he then tried the bakery business. Initially he did well but then the large bakeries forced him into bankruptcy by selling their products at less than cost. My brother, Virgil, and I sold bakery products door to door. This was the atmosphere of my teen years and I did various jobs, working in the South St. Paul Stockyards and parking cars for 20 cents an hour. I did a stint in the Civilian Conservation Corps. (The CCC’S.) We planted trees and fought forest fires in Northern Minnesota. One summer a school buddy and I were lured to North Dakota in the hopes of getting a job on the railroad. The job fell through but I landed a job working for a contractor that did threshing for various farms. The job involved pitching bundles of hay. We worked 12 hours for $5.00 a day. This represented”big bucks” for those days. I returned to St. Paul and entered Central High School with a new suit and shoes (big man on campus). 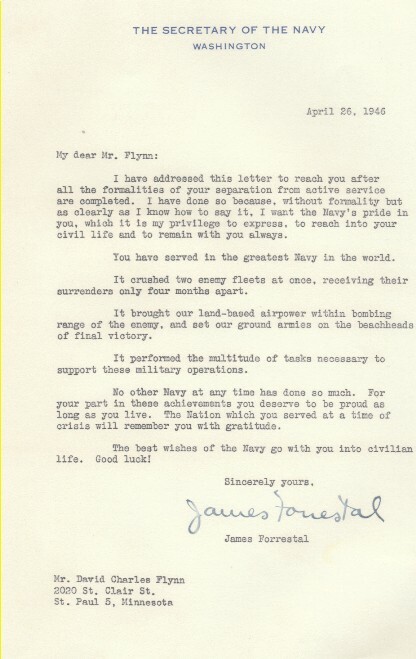 The Flynn boys were not inclined athletically and I wanted to earn a “Letter” in the worst way. Following the summer of pitching bundles, I tried out for the Central H.S. football team. After the first day, every bone and sinew in my body ached but I stuck it out. At the season’s end (I spent it warming the bench), Central was ahead by some astronomical score and I was allowed to enter the game. I took up boxing. My dad taught me the basics and skills were honed at Gibbons Gym in St. Paul. I entered Gibbons’ Monday night fight card and was paid $3.00 for a three round fight. I also fought welterweight in the 1937 Minneapolis Star Golden Gloves. I went out for gymnastics, horizontal and parallel bars, horse etc. And did get a letter on the gym team. I was a member of the Minnesota National Guard. There were monthly drills and two weeks were spent at Camp Ripley during the summer months. We trained on the 45-caliber pistol, Springfield and Browning Automatic Rifles and the 37mm howitzer. 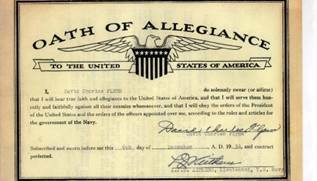 In December of 1938 I enlisted in the U.S. Navy. The Navy attempted to groom me for a job as a dental technician. I couldn’t stand cleaning teeth and pleaded to be sent to sea. I got my wish and was assigned to the U.S.S. Houston. My first assignment was the deck force. We arose at 5:30 am, had a cup of coffee and scrubbed decks until we had breakfast at 7:00 am. This was followed by a day of chipping paint, red leading (priming) and painting. Fridays were devoted to holy-stoning the decks in preparation for Saturday’s captain’s inspection. This consisted of rubbing sand on the deck with a brick. I thought that’s got to be more to life than this. I was assigned as a “stricker” in the radio shack. This involved all the crumby jobs (making coffee, cleaning etc.) while learning and becoming efficient in receiving and sending data in Morse code and learning electrical theory. Mastery of practical and theoretical tests was required for advancement. My “General Quarters” station was as a radio operator in the plotting room. The plotting room was located in the bottom of the ship and was considered its “brains”. Corrections to salvos (turret firing) were made here. The Houston and the Australian Ship Perth were sunk in the Battle Of The Sundra Straits on March 1, 1942. We spent the following 3 ½ years as Japanese POW’s. In August/September 1945 we were liberated and taken to Calcutta, India. Following a brief stay at an army hospital we were flown to New York and taken to St. Albans Hospital. 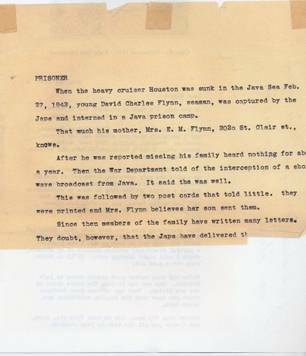 My reporter cousin, Joanie Flynn, learned of my whereabouts, got me out of the hospital and together we sent for my mother. Following a couple of weeks of dinning and Broadway Shows, my mother and I returned to St. Paul. My Alma Mater, Central HS, established a college entrance examination training program for returning GI’s. I took advantage of this and was admitted to the U of M’s Institute of Technology in 1946 and was graduated with a BEE in 1950. 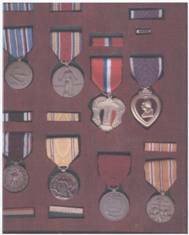 I took a teaching job with the Warren Air Force Base in 1950 and with my wife and son moved to Cheyenne, Wyoming. In May of 1952 I went to work as an electrical engineer for the IBM Corporation. I initially located in San Francisco and later went to work in San Jose. A group I worked with invented the “hard disk” and the job was to build a computer around it. The computer was known as the “RAMAC” – random access accounting machine. I retired from IBM February 1986. The USS Houston, a NORTHAMPTON class heavy cruiser was launched in 1930 and named after the city of Houston Texas. HOUSTON soon gained a place for herself in the annals of US Naval history. 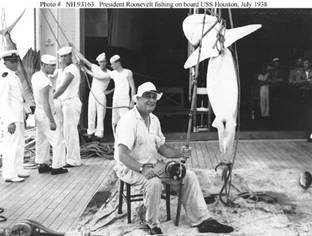 It was a "spit and polish ship" the favorite of President Roosevelt. He made three world cruises aboard the HOUSTON – in 1933, 1935 and 1939. I've. been asked whether . President Roosevelt's dog Falla accompanied him. I suspect not. The Anderson Library in Houston, Texas has an entire wing devoted to HOUSTON memorabilia. I remember of no reference to Falla. A special elevator was installed for President Roosevelt. HOUSTON was also host to the Secretary of the Navy, Chief of Naval Operations and many admirals. The HOUSTON had a displacement of 10,000 tons, 35 knots top speed, armament consisting of nine, eight-inch guns in three turrets, eight five inch guns, 50 caliber machine guns and four mounts of 1.1 inch anti‑aircraft (pom-poms). The latter were installed in October. Following overhaul at the Mare Island Navy Yard in October 1940, the HOUSTON left for Manila to become flagship of the Asiatic Fleet. Admiral Thomas C. Hart, admiral of the Asiatic Fleet, apparently believing that war with Japan was near, ordered all naval dependents returned to the United States. The HOUSTON spent endless days, weeks and months at sea training. 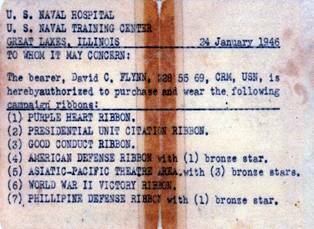 On December 1, 1941 the HOUSTON was in the Cavite Navy Yard. Scouting PBY's reported the sighting of a Japanese force consisting of transports, cruisers and destroyers. Captain Rooks ordered the HOUSTON underway. We dropped anchor at the Island of Iloilo — about 250 miles South of Manila. Although not at war, strict radio silence was maintained. Radio operators would read extensively in an effort to avoid boredom and keep alert. I was on duty reading The Glorious Pool by Thorn Smith. The story line was that the longer one stayed in the pool the younger one became. The main character had fallen in the pool and was screaming at his buddy to pull him out before he passed puberty. The headphones started buzzing and I mechanically typed the message and tossed it in the "in" basket anxious to return to the glorious pool. A second or so later, I took another look at the message. It simply stated: "JAPAN HAS STARTED HOSTILITIES X GOVERN YOURSELVES ACCORDINGLY". The message was given to Captain Rooks, general quarters were sounded and the HOUSTON got underway hugging the shadows of the mountains. The Japanese bombed Iloilo and a freighter was set afire. Tokyo Rose later reported that Imperial Japanese forces had sunk the HOUSTON. The Japanese reported to have sunk the HOUSTON so many times in the following months that she was nicknamed "The Galloping Ghost of the Java Coast. The next several months were spent convoying ships in an attempt to bolster the defenses of Australia and the Netherlands East Indies. On February 3, 1942 while operating in the Flores Sea northeast of Java, along with the light cruiser MARBLEHEAD the HOUSTON came under attack by 49 Japanese bombers. After successfully evading the Japanese attack one of the bombs from the last run went astray and hit HOUSTON'S `after' mast sliding down the leg and exploding alongside turret number three which was trained to port. The explosion-completely destroyed the turret killing 48 and wounding 25, rendering the turret useless, and leaving the HOUSTON without one third of her main battery firepower. I had been assigned to the sick bay. The first injured walked. From then on, they or what was left were carried and laid on the deck adjoining the sick bay. Dr. (Butch) Burroughs worked tirelessly for hours with the wounded. On February 15th the HOUSTON attempted to convoy four troopships from Port Darwin, Australia to Timor to reinforce the island against a Japanese landing. Halfway, the convoy came under attack by some 50 Japanese aircraft and the HOUSTON valiantly defended the convoy by circling at flank speed and drawing the full attention of the planes. Captain Rooks developed a technique for avoiding bombs. 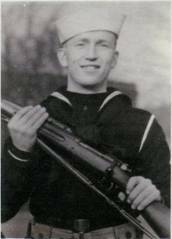 He'd lie on the deck and some 10 seconds after the Japanese planes released their bombs he'd order a hard turn to port or starboard. The bombs would fall harmlessly alongside the ship. The convoy was saved but the Japanese had already landed on Timor. The convoy was ordered back to Port Darwin. After seeing the convoy safely at anchor back in Port Darwin, the HOUSTON headed North to join a fleet that was hastily being put together by the Allies in an attempt to stop or slow down the Japanese who were advancing southward through the South China Sea and Maccassar Straits and sweeping everything in their path. Under the command of a Dutch Admiral (Doorman) the mission was doomed from its very inception. The ships from various nations including England, Australia, Holland and the US had never operated together, some arriving just the day ., before the Java Sea battle. To solve the language problem, Admiral Doorman put a Dutch officer on each ship. Doorman would give his commands by radio in hollandsch. Sometime later the command would be executed. It was at best a "rag-tag" battle group but all that was available to face a superior, well-trained, well equipped, battle tested Japanese task force. On February27, 1942, the two met head on for what was to be the biggest naval battle since Jutland in WWI and the last time that ships stood "toe-to-toe" and fought a traditional surface battle. At the end of over seven hours of bitter fighting and heavy losses on both sides, the HNIAS PERTH and the USS HOUSTON, the two remaining Allied Ships, were ordered to disengage the enemy and head for the western Java Port of Djakarta, refuel and proceed to the southern port of Tjilatjap and evacuate American troops from the island. Arriving at Djakarta during the early morning of February 28th, the HOUSTON and PERTH found the port in complete chaos. The Dutch had already evacuated. The refueling hose had to be "jury-rigged" to get only a portion of the fuel needed. Dutch air patrols reported no Japanese naval activity within 250 miles. The HOUSTON and PERTH left Djakarta in the early afternoon confident that they would be able to break through, evacuate the troops to Australia and finally get much needed rest, repair and replenishment of supplies and ammunition. About 11:00 pm just before reaching Sunda Straits at the western end of Java, PERTH sighted and fired upon several Fubuki class Japanese destroyers. Some 55 Japanese transports were already unloading troops. HOUSTON and PERTH sighted a Japanese Task Force consisting of four cruisers, 13 destroyers and an unknown number of torpedo boats. The scene that ensued was utter chaos - shells and torpedoes went in all directions. Survivors later told of seeing many sunken Japanese ships along the Javanese Shore. Shortly after midnight the PERTH took her fourth torpedo and went down. HOUSTON fought on until approximately 12:25 on the morning of March 1, 1942. She took a fourth torpedo and abandon ship was ordered. I left my battle station in the plotting room, climbed up the inside leg of the main mast and exited at the communication deck. Fires were everywhere. The Japanese had encircled the HOUSTON, illuminated it with searchlights and were raking the HOUSTON with shells and machine gun fire. Star shells and occasional 50 caliber machine gun bursts emanated from the HOUSTON. An exploding shell killed Captain Rooks. Some shrapnel hit me. I entered the water with the goal of distancing myself from the ship. The Japanese continued to rake survivors with shells and machine gun fire. I'd swim under water as long as I could, surface, glance at the HOUSTON and submerge. Finally, the HOUSTON and the Japanese vanished. All was quiet and dark. During the night I met another HOUSTON survivor. We talked for a while and mutually elected to separate. We'd make smaller targets. About noon on March 1st, 1942, I was picked up by a Japanese boat and taken to what appeared to be a repair ship. There were four or five other HOUSTON survivors on board. We were given blankets, clothes rung out and my shrapnel wounds attended to. The captain interrogated us, "where is the Enterprise, Lexington" etc. We knew nothing. Some hours later, the Japanese ship was torpedoed. I went over the side (in haste I put my pants on inside out) and started swimming. I later found myself topside of a Japanese destroyer along with many Australian survivors. After some time (no food or water), we were transferred to the hold of a Japanese transport – the Sandong Maru (Japanese for safe voyage home). We were held there many days with little food or water. (The containers that were used for human refuse also served as food vessels.) Men continued to scream and to die. We were taken to Serang Java. While the Japanese decided what to do with us, we were made to stand in a destroyed railway station surrounded by many Japanese soldiers with fixed bayonets. Eventually, we were herded into a native movie theater. The seats had been removed and the prisoners seated in a cross-legged fashion. It was not possible to lie down. The Japanese manned alcoves and boxes with machine guns. Food was a rarity and consisted of rice and boiling water. Prisoners continued to die. Sanitary facilities consisted of a trench located to the rear of the theater. Flies abounded. My left leg began to swell. A couple of Aussies took me to the Perth's doctor who'd set up shop outside the theater near the latrine trenches. He lanced the leg using a razor blade. Weeks later we were moved to Bicycle Camp in Djakarta. Bicycle camp was a staging area for shipment of POW's to Saigon (Bridge on the River Quai and Death Railway fame), Japan's coalmines, steel mills and shipyards as slave labor. Officers were sent to Manchuria. Selection seemed to be based on physical wellness and was made by a Japanese doctor. I remained in Java. 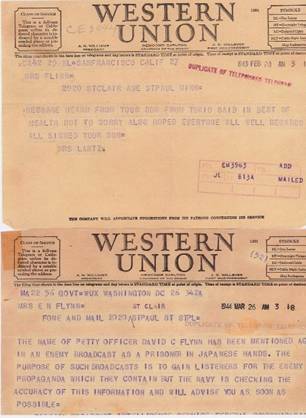 We were ordered by the Japanese to sign a document stating we'd work for Dai Nippon, would make no attempt to escape etc. Our officers ordered us not to sign. To do so would be considered traitorous. The officers were taken away. Every 15 minutes a Japanese "bashing" squad would appear, yelling and would beat us with rifle butts and clubs. It was decided between the POW's that this constituted duress and signed their piece of paper. Life settled into a boring routine of work parties, being sick, beatings etc. Work parties involving Aussies were always nerve racking. One day we were required to unload 50-gallon drums of aviation fuel from trucks. Old automobile tires were placed at the rear of the truck bed to break the fall as drums were rolled off. After every fourth or fifth drum, an Aussie would pull a tire away causing the drum to rupture. The leaking drum would then be carried to a waiting barge. Life was not completely lacking in levity. A suyakasan (Japanese interpreter) approached me one day. 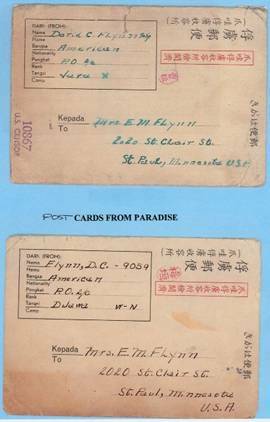 He had a letter from an American patient in a sanatorium. The translator needed help in understanding the letter. (We never received letters.) After lamenting his problems for a paragraph or so, the patient went on, "say I'm sure sorry to hear of the fix you're in." He continued, "why is a Japanese pilot like a woman's girdle." The punch line, "a good yank can bring them both down". "What does this mean," asked the interpreter. I tried unsuccessfully to explain double-entendre, two meanings and play on words. He left muttering, "wakardemasen, wakardemasen'. (I don't understand.) The Army Air Corps arrived and took the American POW's to Singapore and then to Calcutta. We remained in a Calcutta army hospital a few weeks. The group I was with was Loaded on a C-54. We made it as far as Karachi and engine trouble forced a transfer to a C-47. Our next stop was Iceland and then on to St. Alban's Hospital in New York. 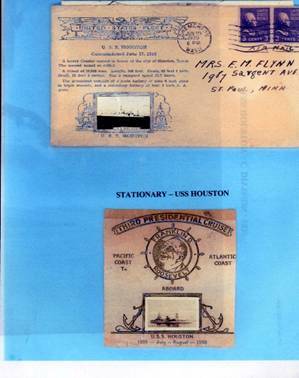 Boca Raton · David Flynn was deep inside the bowels of the USS Houston as the Japanese pummeled the ship. A radio operator, he had to climb seven levels using the foremast's trunk. As he emerged three levels above the main deck, a bomb exploded nearby. Shrapnel pierced his legs, buttocks and back. Flynn ended up in the water, enemy fire all around. Flynn sat in his Boca Raton living room recently recalling the World War II battle in the Sunda Strait near Jakarta, Indonesia. He was among 292 men who survived the sinking of the Houston and the years afterward as a prisoner of war. "The worst part was, for no reason at all, the beatings," said Flynn, 87. James D. Hornfischer, a writer, literary agent and former book editor, details Flynn's story and that of survivors in a new book published Nov. 7, Ship of Ghosts: The Story of the USS Houston, FDR's Legendary Lost Cruiser, and the Epic Saga of Her Survivors. Hornfischer said Flynn was the only survivor of his battle station and his sharp memory helped the author fill in many details during interviews. "He has almost total recall," Hornfischer said. 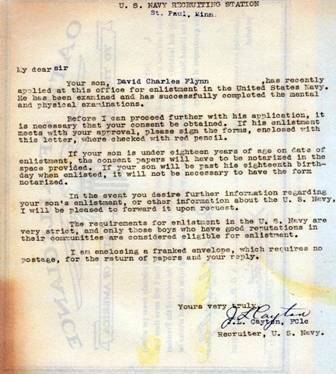 Flynn enlisted in the Navy as a teen in St. Paul, Minn. It was December 1938, peacetime. "The Navy wanted to make a dental technician out of me," Flynn said. "But I couldn't stand cleaning teeth." A former ham radio operator in high school, Flynn found his way into a job in the radio room. 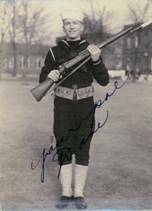 So he was one of the first on the ship to know that the United States entered World War II. He was engrossed in a book when the Morse code started clicking. The message, he said, was: "Japan has started hostilities. Govern yourself accordingly." Just three months after the attack on Pearl Harbor, the Japanese sunk the Houston after a long battle and survivors were taken prisoners. Many were put to work in the jungle building a stretch of the 258-mile infamous Burma-Thailand Death Railway. The book tells the tale of the battle and more than three years the survivors spent as slave labor for the Japanese war effort. Flynn's injuries kept him from the railway, since his captors sent the healthy men to work, he said. Jack Green, public affairs officer for the Naval Historical Center in Washington, D.C., said the U.S. Asiatic Fleet was the first line of defense against the Japanese at a time when the war was not going well. However, it had no chance against the entire Japanese naval fleet. "The USS Houston did put up a gallant fight," Green said. "It went down with guns blazing in an epic battle." After the war, Flynn studied engineering, married Donna Mae, had four sons and worked for IBM in Boca Raton. In 1985, he retired. Flynn is the lone Houston survivor in South Florida. Hornfischer said about 30 of the men are still alive. That's why imperative to capture their experiences and put down on paper their "portrait of heroism," he said. $85,000,000. This was sufficient to build a second USS HOUSTON and a small aircraft carrier -- the San Jacinto. One thousand Texans signed up to man the ships. Houston's Poet Laureate: HOUSTON, "Earned the name of `The Galloping Ghost', A fleeting shadow on the Java Coast Duty and Honor to Country, the code they knew, Well Done', to our `HOUSTON' and her crew."